The fourth edition of In Search of the Divine features Native American teacher Gene Goodsky, who shares the tradition of harnessing healing plants; Sister Charlotte Berres, CSJ, whose life journey brings her back home; Mike Hendrickson’s story of drug abuse and recovery who, with his mom Karen Marie Parenteau discover trouble, heartbreak, and reawakening; and Sister Marian Louwagie, CSJ whose breast cancer recurrence brings her presence and understanding. Runtime: 28 minutes. Request a copy or make a comment about this program. 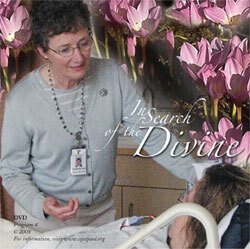 The following are brief clips from episode #4 of In Search of the Divine.